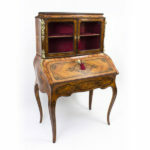 We are pleased to have added this lovely antique Victorian burr walnut and inlaid Bonheur Du Jour, or Ladies writing desk to our inventory. 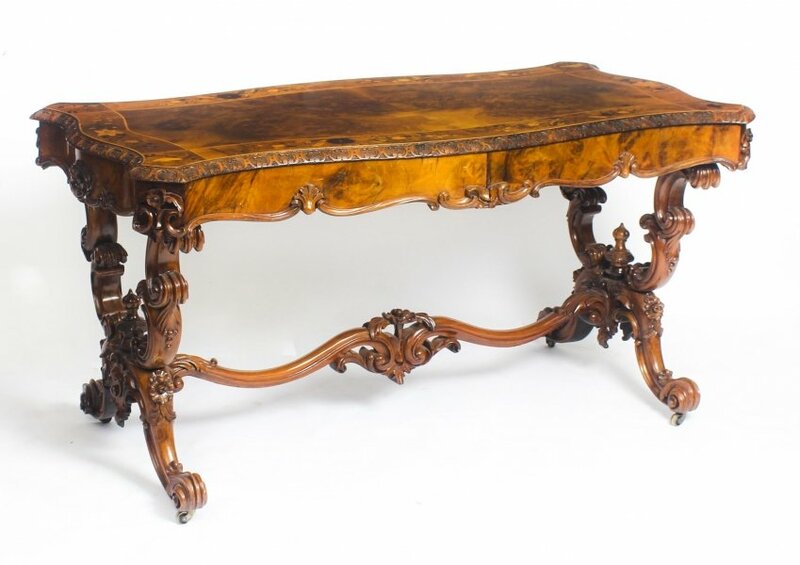 It is offered for sale at just £3250 and is in truly excellent condition following careful and expert restoration by our own craftsmen in our own workshops. 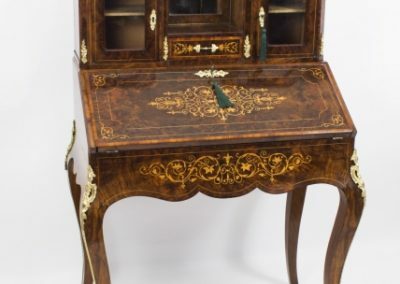 Here is an antique ladies writing desk, which our experts have dated to around 1860, that would not only be a joy so sit and work at but which will look good wherever it is placed in a room. 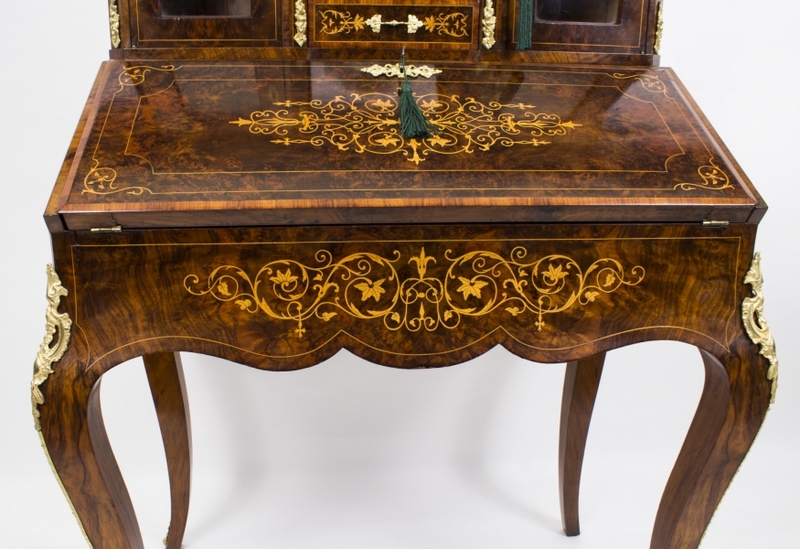 May we draw your attention to the beautiful grain and the rich colour of the burr walnut that has been used together with the meticulous and expertly accomplished inlaid decoration. 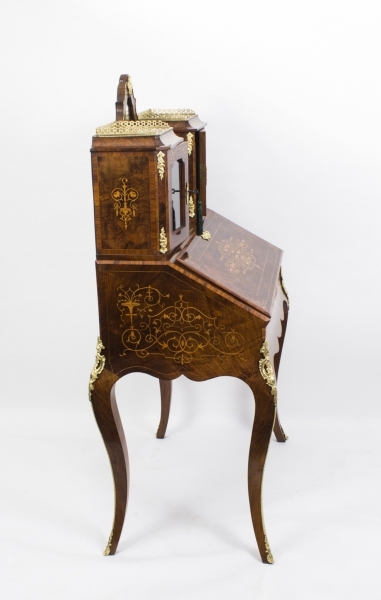 The piece is further enhanced by superb ormolu mounts. 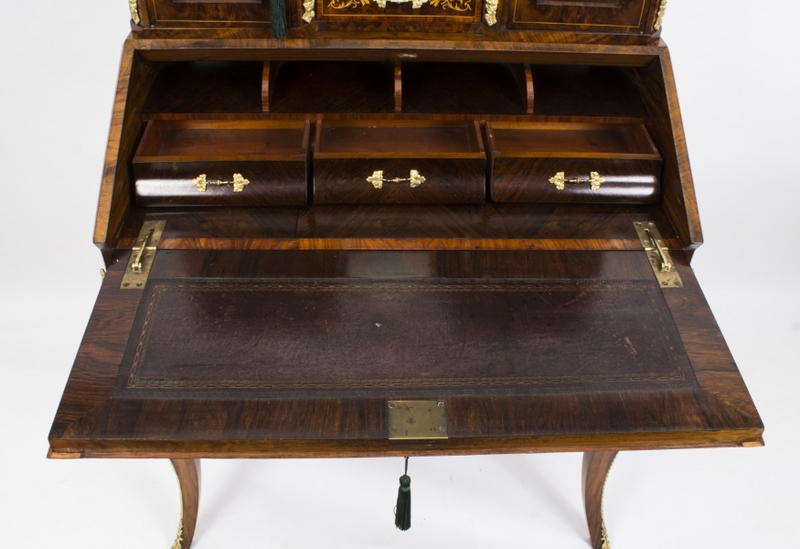 The fall front of this antique writing desk opens and reveals a nicely finished rosewood interior and you will note the gold tooled inset leather writing surface which complements the richness of the burr walnut perfectly. 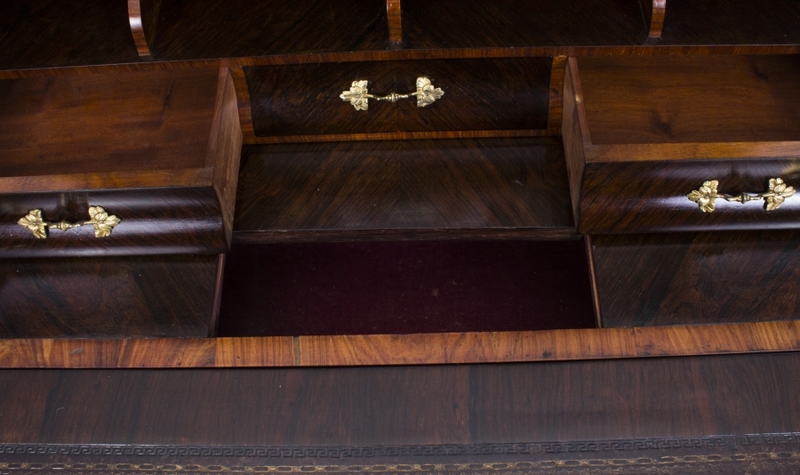 As you can see, when open, the Bonheur Du Jour reveals a useful set of three drawers together with a slide that gives you access the secret space that is located below. 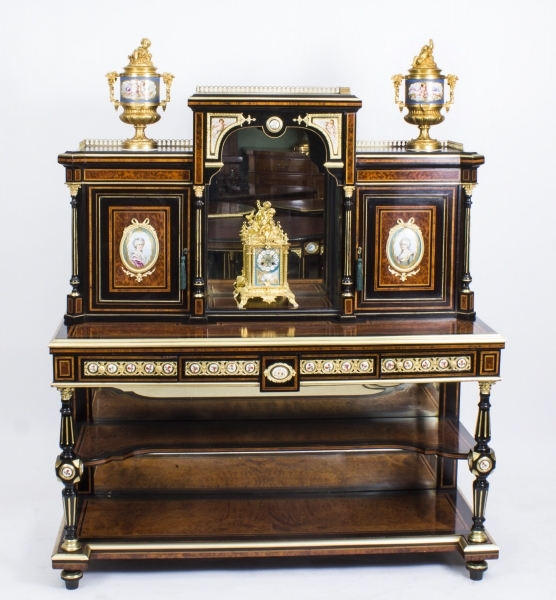 At the top of this antique Victorian ladies writing desk there are a pair of useful and spacious cupboards which have delightful glazed doors and can be used for displaying ornaments or just for storage if preferred. Flanking these are a further small drawer and, a lovely touch we hope you’ll agree, a small mirror. 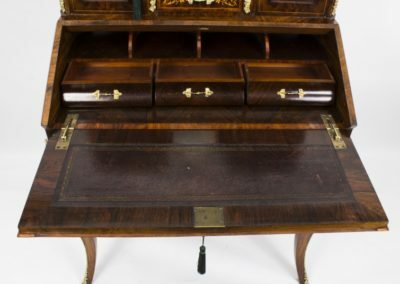 Down below, the Bonheur Du Jour stands on attractive yet sturdy cabriole legs and we are pleased to confirm that this writing table still retains the original working locks and keys. 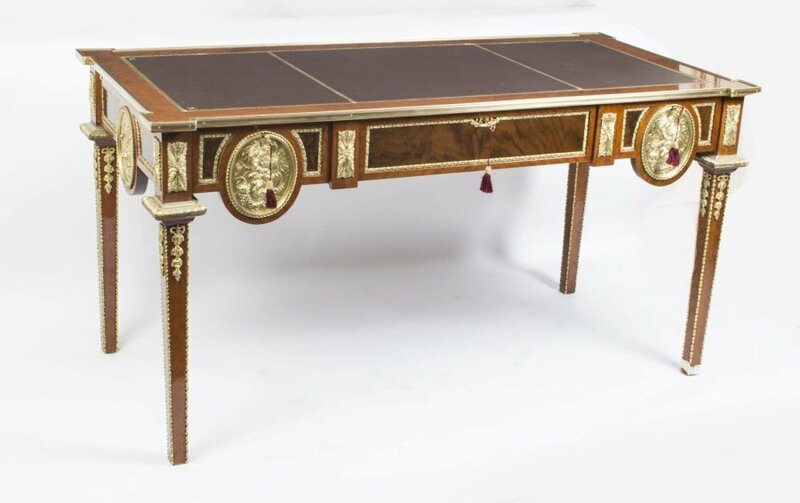 No-matter which way you look at it, this is a very attractive and useful antique writing desk and it is in excellent condition so that it can be enjoyed by all who see it. 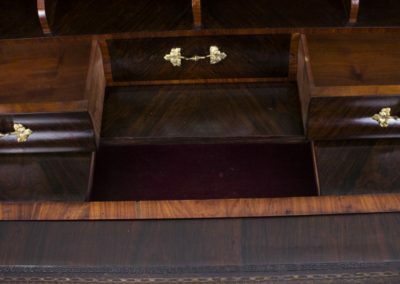 The desk measures 141cm high x 81cm wide x 54cm deep or, in feet and inches, Height 4 feet, 7 inches x Width 2 feet, 8 inches x Depth 1 foot, 9 inches. 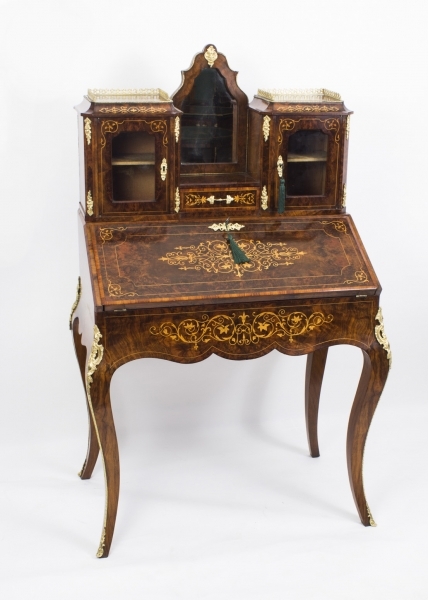 The term “bonheur du jour” which, in French, means “daytime delight,” is a type of lady’s writing desk which was introduced in Paris during the late 18th century and became very popular and fashionable. Bonheur du jours are typically light and graceful items with the special characteristic of a raised back. 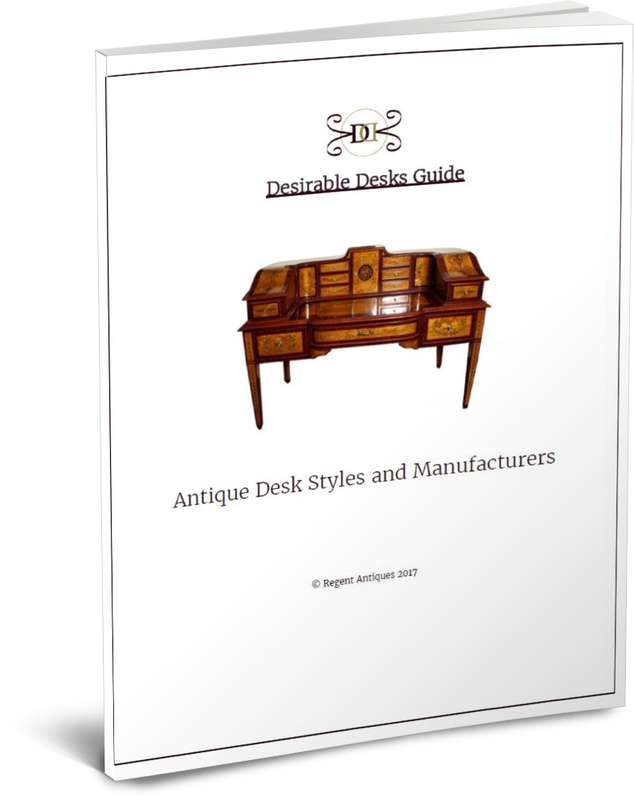 This delightful ladies writing desk can be lovingly packed and shipped to any destination – please request a shipping quotation before placing your order. Thank you. UK mainland customers are able to benefit from free shipping on this item. 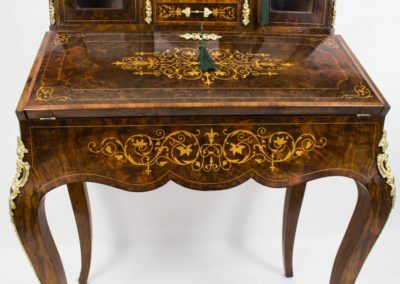 If you can visit our north London showroom then please do – you can inspect this lovely writing desk at your leisure and ask questions of our resident experts. If you can’t make the trip please call us on +44 20 8809 9605 and we will tell you everything you need to know – it would help if you quote our stock reference 07594 when calling or emailing so that we can be sure that we are all talking about the same item.